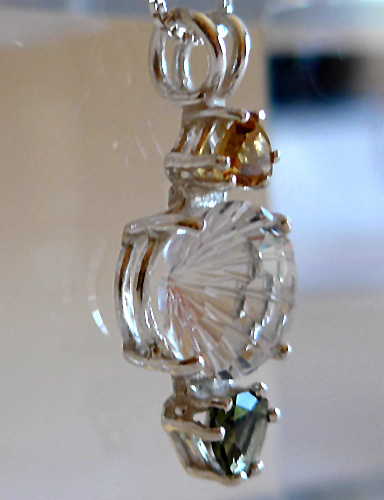 Dimensions (HxWxD): 1" x 0.45" x 0.35"
This lovely Clear Quartz Super Nova Pendant with Citrine and Moldavite Accent stones is a new cut for the 21st Century from our favorite jeweler who brought you the Star of David, Ascension Star, Angelic Star and other Tools for Evolution. 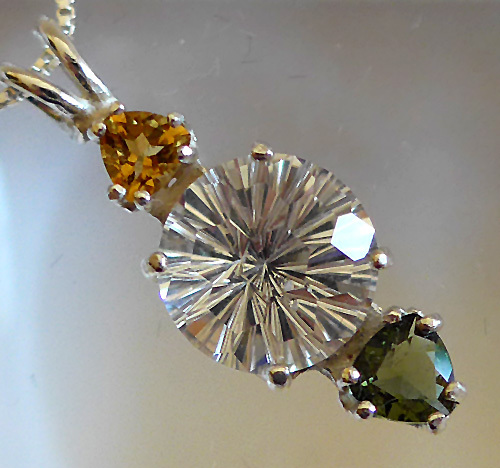 The combination of the Citrine and Moldavite accent stones with the Clear Quartz Super Nova should amp up the protective and introspective qualities of all of these stones. I would think these little accent sparks of color will deepen your connection to your Higher Self and the Divine. This powerful citrine and amethyst gemstone pendant is an ideal piece to wear for beauty, protection and assisting in our connection to our Higher Self & the Divine. As we explained above, citrine is a form of amethyst that has been highly pressurized and/or super-heated during formation in the Earth, and metaphysically the combination of amethyst and citrine indicates the alchemical transformation of the human personality and egoistic mind into the golden and violet rays of the Higher Mind and Higher Self, connected directly to Christ Consciousness. If you want change in your life, Moldavite combined with clear quartz can expedite that change, connecting you to Source & your own Divinity. 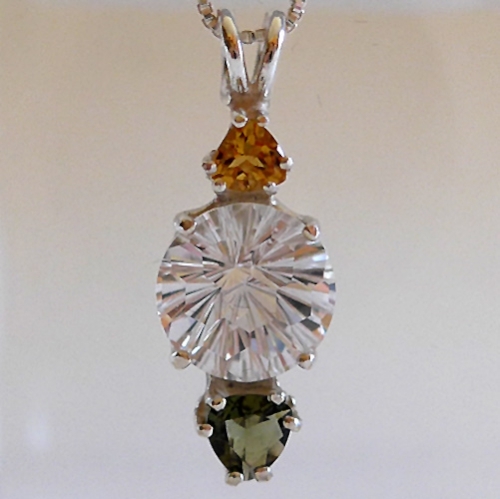 Moldavite is a rare bottle-green translucent stone of unearthly origins. Scientists postulate that a meteor shower in the Moldau Valley of Czechoslovakia some 15-20 million years ago caused extra-terrestrial material to fuse with earthly rock formations at very high heat, forming fused glass -- the only moldavite known to exist. Note: Weight above is shipping weight. Actual weight is 4.5 grams. Each piece is unique and may vary slightly in appearance and dimensions from photos. Each piece is beautiful and guaranteed to meet with your complete satisfaction!